Just a girl who loves to spread the joy of a vegan lifestyle. This image is taken from a Scientific American Slideshow. I’ve now been living in Asia pretty consistently for 10 years now. I have been lucky to spend decent lengths of time in Vietnam, Thailand and Indonesia (and although not in Asia, I have spent a year in France and also Morocco). The first five years were spent tour-leading for a company that focused on trips that were considered culturally appropriate, fun and low impact. I spent much of my time having local interaction with the local people, taking my clients to local restaurants. markets, temples, taught them a bit of language and I have to say, I really enjoyed it It was during that time, that I started to doubt my vegetarianism values. As I have discussed on my Story of Transformation post, I really felt that not eating animals and participating in some of the activities that were such a significant part of culture, I was somehow disrespecting the practices of the locals. For more selfish reasons, I thought that I was perhaps missing out on so much by not eating an ‘authentic’ Tom Yum Goong with the shrimp inside rather than having it with mushrooms instead. Fast forward a few years, I am now a committed vegan, and because of my interest in other cultures and traditions relating to animals, I was fascinated to learn about mercy release today and also completely shocked by it. Anyone who has spent any time in Asia, will be familiar with the concept. It’s a Buddhist tradition and involves the release of captive animals. Buddhists will release animals as a way to gain merit. The origin of this centuries old tradition is the idea that spontaneous acts of kindness and compassion will mean something when judgment day comes. I have posted about religious reasons for using animals just last year when I wrote about Eid Al Adha – which is the ritualistic slaughter of an animal at the end of the fasting month. I have recently found out a lot more about mercy release and like most traditions (cultural or religious) that we practice today that involve animals, the origins of those traditions were started out of necessity, but today have become a commercial operation and / or are no longer necessary. I myself have witnessed mercy release in my wanderings around Asia in the few years in the following places. In the lead up to Tet (Vietnamese New Year) when fish are released in to bodies of water (that is often not the cleanest it could be). Walking through the streets of Bangkok, there will be people walking around with cages full of finches. The vendor will gesture to tourists and of course to anyone who will pay the money to come over the release the birds. In Thai temples (of which I visited sooooo many in my tour-leading days) there are often vendors who will sell the opportunity to release animals (often birds, turtles and eels) to those who are visiting. Of course, Buddhists who are coming to the temple are in merit-making mode and will often participate in this. Tourists often do this too. Of course, all those little animals in small cages, of course we want to let them go. I have to admit, that until just a couple of hours ago, I had little idea about this industry. I don’t think I have ever participated in it even in my tour-leading days. I heard rumours from other tour leaders that the animals are often recaptured. I have to admit, I wondered how an animal could be captured twice (What terrible luck!) and wondered if this was THAT bad, but at the same time, there were a heck of a lot of these animals in the cages. I probably should have found out more, but you know… I never got around to it. Well, I just found out a whole lot more in one of favourite animal rights podcasts, Our Hen House. There were interviewing Iris Ho from Human Society International who was interviewed about this issue. In Taiwan, there are 200 million animals that are ‘mercy released’ a year. I cannot imagine how many animals go through this fate altogether considering China is a country that also practices Mercy Release. Considering these animals are trapped from the wild or bred in terrible conditions, this is an almost unbelievable. The animals are often transported long distances and suffer incredible stress. Many die during this process or shortly after release. They are released in places that are not native to the animals there so there can be considerable environmental impacts. The animals are trapped and the traps are often not checked for a long time. Many die before they are even collected by the trappers. Many can be injured during this trapping process. To hear the podcast interview, listen here from 28:24 for about 20 minutes. For a snapshot of the issue, here is a video that has been produced by HIS. It’s in Chinese, for the Taiwanese communities. Please take a few minutes to find out about more about mercy release. The idea of showing compassion towards animals to gain merit is certainly a noble one. I would like to suggest that very often these traditions and rituals have become involved in ego, rather than about what the actual message was about when the tradition started. Here’s a few examples. Thanksgiving has become about Black Friday sales and gluttony rather than simple gratitude. Eid el Adha has become about who has the biggest animal to slaughter (the rich will often have the bigger more expensive animal) rather than breaking fast and sharing meat with the poor in a time of scarcity where there wasn’t much food out there. Kosher and halal slaughter – the idea that the animal has to be fully conscious so that consumers could be sure that the meat was healthy has now become a reason NOT to stun the animal before slaughter. There is plenty we can all do to raise awareness about this practice and practice alternative types of mercy release to gain merit whether you are Buddhist or not. Don’t participate in the practice and educate others about it. Support HSI’s work and share the information around your social networks and over the water cooler. If you work in the tourism industry, please educate your passengers about this issue and ask them to not participate. Don’t visit temples that support this practice and explain why to the monks. I wish I had known more about this issue when I was tour-leading. Even if you are Buddhist, you can still gain merit by spontaneous acts of compassion towards animals. Become involved with legitimate release of animals, like ones that have been rescued and then help release them back in to the wild (turtle release programs, cleaning animals after oil spills etc) or perhaps even better, help animals 3 times a day by NOT doing something! That’s right….. Not eating them! OK. It might not be looked on as favorably in your religious community, but if you are into pleasing the Gods, I am sure they will think your intentions will gain you loads more merit. Since going vegan three and a half years ago, I really do believe that I am much healthier than I was before. Some of these changes are tangible some are just ‘how I feel’, and I just wanted to share what some of those are. Obviously, this is not a scientific study and I m not claiming anything more than this is what I have observed, and these improvements have been noticed by other vegans and have been documented in research too. First of all, I have to say that even before I was vegan, I did not really have many health problems. I was rarely sick but I did seem to get more than my fair share of colds, probably about 3 or 4 per year and I also suffered from what I thought was mild hay fever. I also think it is worth noting that since I have been vegan, my diet has really changed. Today, I eat a huge amount of vegetables of many different colours, which are incredibly nutrient dense, the grains I cook at home are nearly always whole grain but I still try to limit those as they displace the vegetables that are much more healthy. When I started being vegan, a typical dinner might have been a huge plate of pasta with a vegan pesto for example. These days, I might still have the pasta, but it will be a much smaller amount and with a massive green salad on the side and the pasta will probably be wholegrain. I won’t eat pasta 4 times a week (yes…really) rather it will be once a fortnight, perhaps less. Why are vegetables so important? If we consume a massive amount of different colour vegetables, we are consuming a massive number of photochemicals. These phyto chemicals are so important to our cells’s health and are just not available in animal foods ( phyto actually means plant) which is why government recommendations are that half our plate be filled with non starchy vegetables. My nails used to peel considerably and today they don’t. I used to suffer from lots of colds, I rarely I get them anymore. Last year, I got one cold and I think I have had 3 in the 3.5 years I have been vegan. In 3.5 years I have taken 2 days sick leave from work and one of those was a mild flu (fever) and the other was due to a bug of some sort (shaking someone’s germy hand probably). Considering that I work in schools with children in a tropical climate, I do think my immune system is working very well indeed. I used to suffer from something I can only describe as morning mucus… Gross….. I don’t anymore. I suspect might be down to drinking dairy products. No scientific proof, it’s just a hunch! I have also lost a considerable amount of weight. I am now on average 8kg lighter than I was before I went vegan (About 13% of my total weight). When I went back to Australia for the first time last Christmas, many family members commented on how well I looked…. OK… They might have just been polite, but I’ll take it! I am sure this is down to me eating foods that are nutrient rich and lower in calories than dairy, refined flours, cheese etc. I also very rarely drink anymore. As part of my school’s insurance package, I was also able to have a full medical back in May, ’12 and as well as the general stuff you get tested for, I also asked for tests for my iron, b12 and calcium. I was so happy, to find out, that actually according to those test results, I am in excellent health. My cholesterol is at a very good level (much lower than ‘normal’)*, all my nutrients levels were in good shape. While, I know that my results might have been the same if I was vegan or not, especially as I do not have a ‘before’ test to compare but I do know for sure that I am in excellent health DESPITE being vegan. *It’s worth noting here that people who have ‘normal’ cholesterol levels STILL get heart attacks. I want to be heart attack proof which is why I aim for a very low cholesterol level. Another 30 Day Vegan Challenge? It is true! But this time I am not conducting it. It’s someone much more qualified and experienced. People who have recently been reading my blog will know that in San Francisco I met up with Colleen Patrick-Goudreau. Over dinner she told me lots about her next big project which is essentially an online guide to help people make the change to become vegan. The challenge conducted over 30 days has everything you need to make the switch. Colleen’s podcast woke me up to the unnecessary suffering of animals and I am so excited that there is yet another medium out there to help people make the change to a compassionate lifestyle. For those interested, please add your email address and you can take advantage of the ‘early bird’ rate of $20 (the price of a book covering the same topic). The price is extremely low considering the work that has gone in to it and the quality of the production values. Here are the daily topics that will be covered each day. I have been following Farm Sanctuary’s work for quite a while now and I am completely enamored with them. 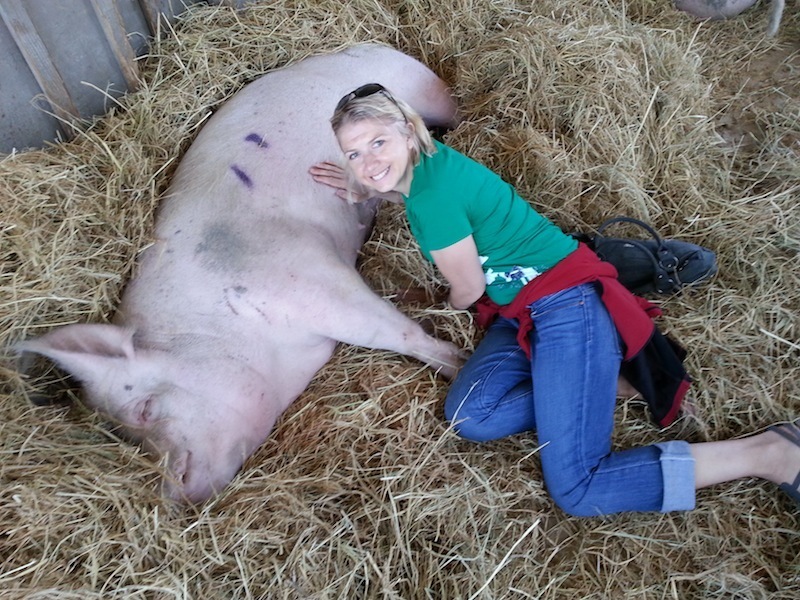 Farm Sanctuary is such a wonderful organisation and I believe was one of the first sanctuaries for farm animals. Since Seb and I heard of them, we have supported them by sponsoring animals, usually hens (larger animals are expensive). Our first hen called Wendy passed away about a year ago and we received the most touching heartfelt letter telling us of her last few days in the sanctuary and the impact she had had on those around her. 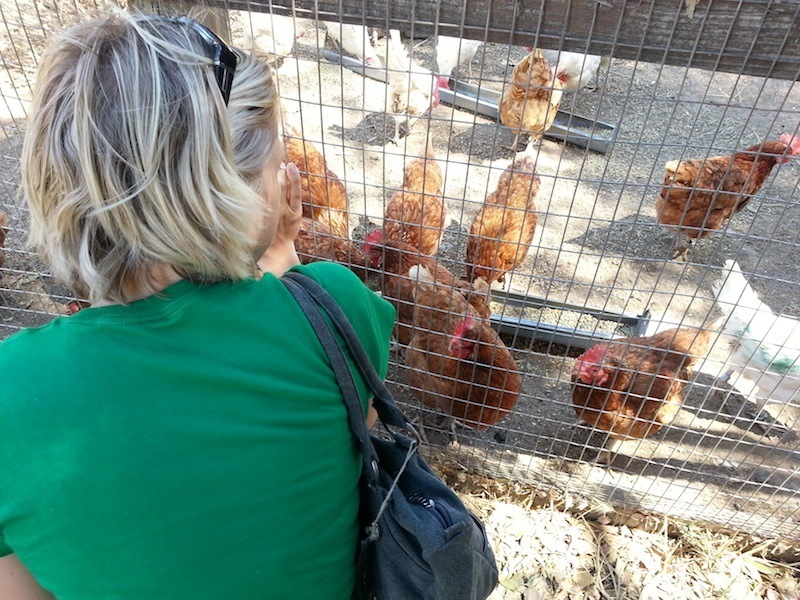 We knew that this place is a special and that we wanted to include a visit to the farm on our once-in-a-lifetime trip. 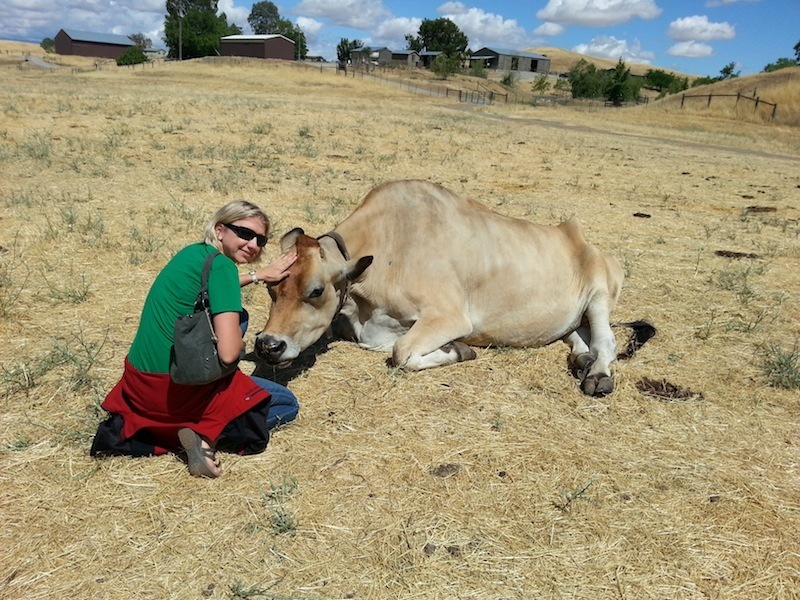 Having met my dearest younger brother the afternoon before, we drove part of the way to Farm Sanctuary to a town called Vacaville (Vaca is spanish for cow which seemed rather apt given our visit the next day). We got up early in the morning and headed off for one of the farm visits that they do every Saturday morning. As we were walking around the place we were struck with many things. 1. Just how incredibly clean the place was. I was lying on the ground in the pig shed with my head on a pig’s belly and there was no pig poop anywhere to be seen. They told us how with only 600 animals they are able to manage the waste generated from the animals on the farm without having to take it off site or put it in those terrible holding ponds that cause such pollution. I love this! 2. 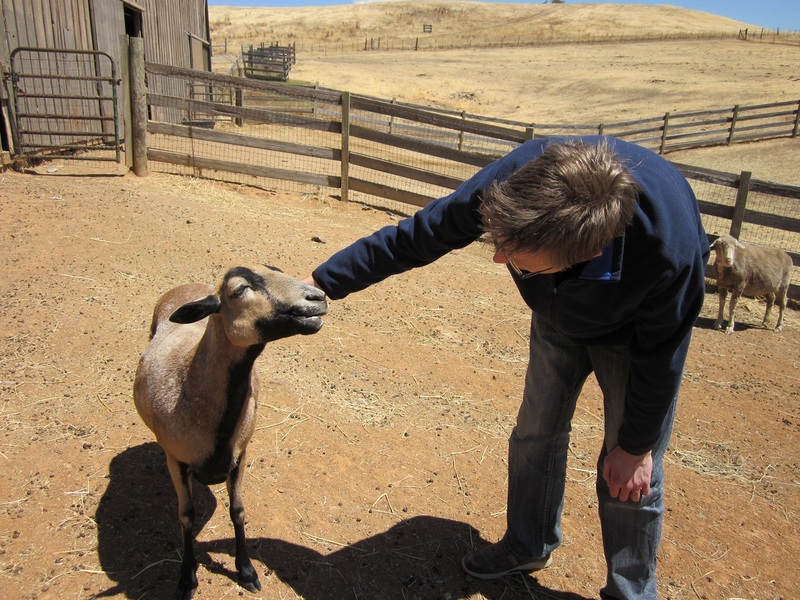 Just how friendly and relaxed the animals were. I grew up in a village near farms so I have seen plenty of farm animals, but I have to say that I was never able to approach sheep or cows. Obviously this is because most farm animals will not have the love and affection and time spent with people that the animals have at Farm Sanctuary so it was so special to see the bonds that CAN exist between farm animals and people given half a chance. 3. How knowledgeable the guides were about the individual animals, their knowledge of farming as well as their ability to communicate with their tour guests (we had some who were NOT yet vegan). 4. I was really astounded as to how big cows and steers are when you get up to them. I was able to get up close with a 16 year old steer called Yugo and I was moved by how huge he was. Such a wonderfully gentle animal with the most beautiful dark eyes. 5. We were all particularly surprised to find out about the care needed for the older animals. 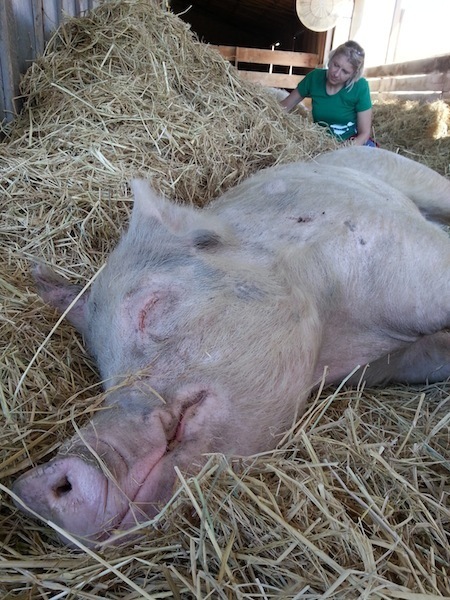 There are several animals at the sanctuary who are now middle aged or elderly and there is very little known about how farm animals age and what to do with them when their do. Farm Sanctuary are working with Cornell university to try to work out how best to deal with animals that have arthritis and other aliments considered with aging. I found the fact that no-one knows what happens when animals age is incredible. We have manipulated turkeys to have such large breasts that they can no longer reproduce naturally or cows to produce such a large amount of milk yet we wouldn’t waste the time to research animal arthritus considering animals are nearly always slaughtered when they are still so young. Here is a list of common farm animals, their natural lifespan and their ‘actual’ lifespan from Humane Facts. Essentially nearly all animals are killed when their are babies. Babies! No wonder we have no idea on how to deal with aliments concerned with getting older. 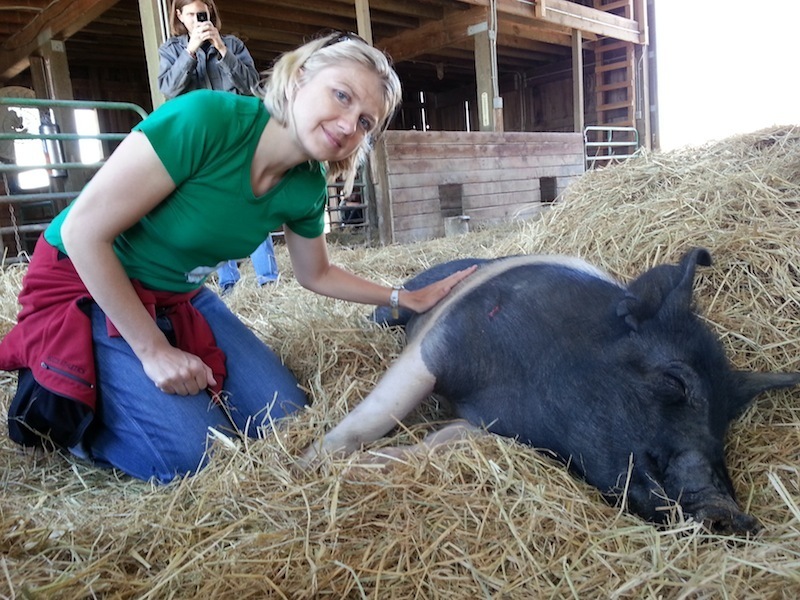 Farm Sanctuary or any other farm animal sanctuary is a great place to take people and your children who want to connect with the animals that might be on their plate and to find out more about factory farming. I love the work they do. 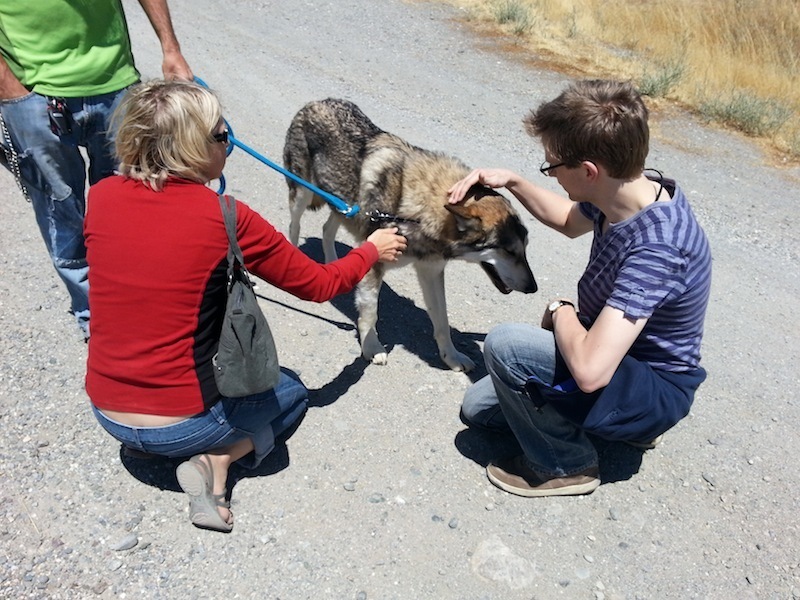 Working with politicians to try to introduce laws to help animals. Their promotion of a vegan diet for our health, the environemnt and of course the animals. Their events like Thanksgiving FOR the Turkeys, the documentaries they have made like the heartwrenching Peaceable Kingdom and their incredible rescues. The animals are wonderful ambassadors for their species and highly recommend a visit. I am not sure of an exhaustive list of sanctuaries on the internet, but this list is a good start. or just google sanctuary and your local area. If you want (or you want your child) to connect with animals, consider visiting a farmed animal sanctuary.Petting zoos and zoos generally are not great places to do this as they are exploiting animals not helping them. 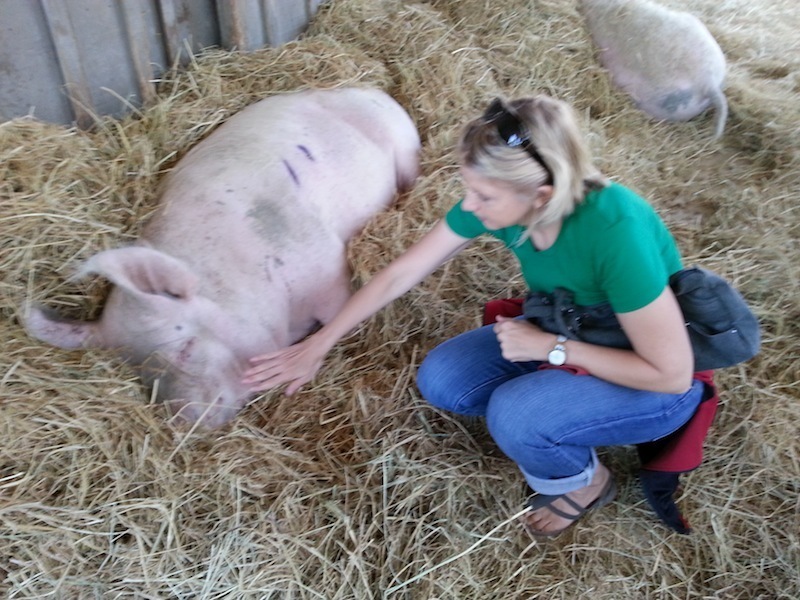 Most sanctuaries have open days or will do a private tour for a donation. Unlike a zoo, this is one excursion that could change your life and that of your child’s for the better. Who doesn’t want to have a child whose heart is full of compassion and love for all beings? Jack with one of the goats. 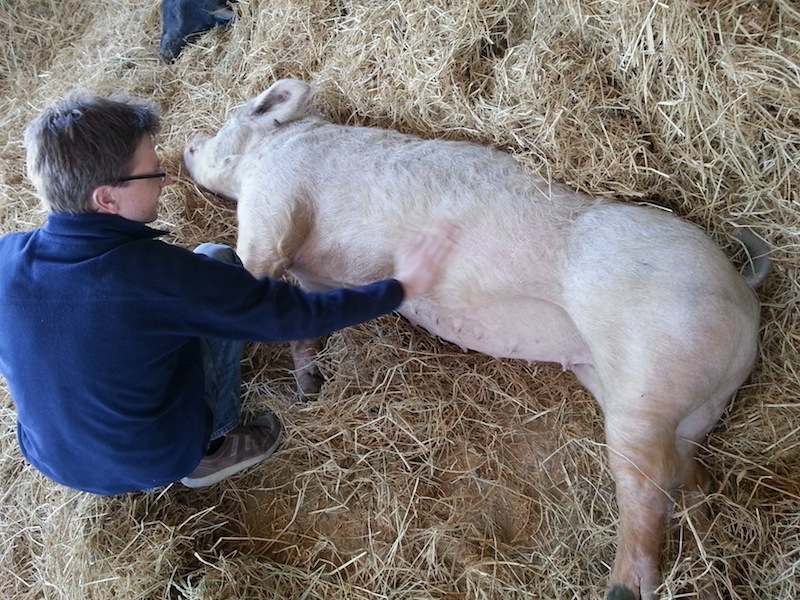 Jack with one of the lovely pigs. Letting him sniff me before I go in for a belly scratch. 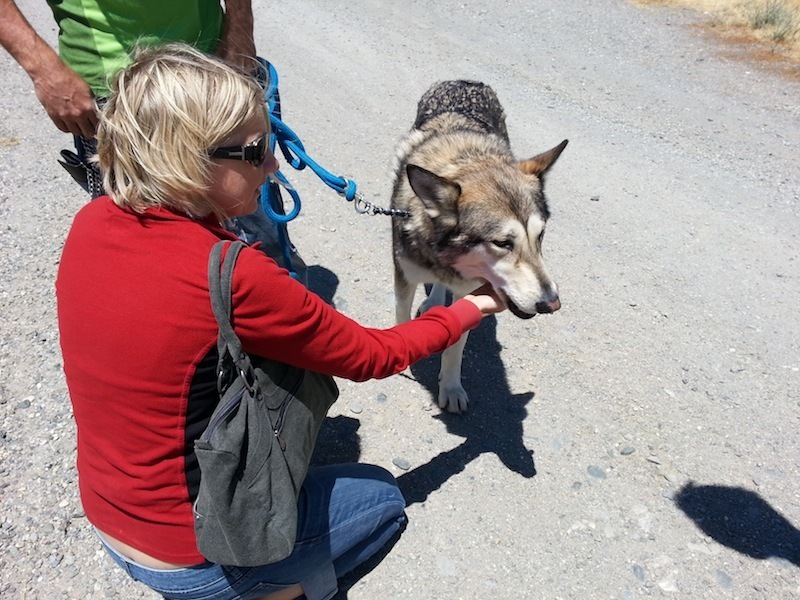 We also were lucky enough to bump in to the manager of another sanctuary in California called Lockwood Arc and sanctuary for wolves and wolf dogs. Fantastic work they are doing helping war veterans to rehabilitate with help from the beautiful animals from Lockwood. Ildi completed the 30 day challenge last month. Here are her thoughts about the challenge and where she’s going now! Thanks for sharing Ildi! What were the motivating factors behind taking the challenge to go vegan for 30 days? The biggest motivation were YOU, Brighde. Your energy and support, the Christmas Dinner,the shopping tour, the cooking classes were great and motivated me too. Also I believe, I can do some good for the animals, nature and for my health to change my diet. Now the challenge is over, do you think you will go back to the way you ate before? Why? Why not? I won’t go back, because I don’t have a reason. The vegan diet suits me, I’m not hungry, don’t have cravings. Here in Indonesia there are lots of beautiful fresh fruits and veggies, tofu, tempeh. What were the big challenges during the month? To go out with non vegan friends and share the meals. How have your family and friends reacted to you doing the challenge? Supportive? Did that impact you in anyway? I think, my parents still worry a little bit, because they think I don’t eat properly. Is there anything that you found easier than you thought it’d be? I didn’t have any cravings. Do you feel differently about cooking now? I love to try out new recipes, discover new dishes, flavors. Still I need to experiment a bit more with tofu and tempeh, and use more raw food. Of course, people are most scared of giving my cheese and dairy products. How do you feel about those products now? Is there another food that you thought would be difficult to give up? How do you feel about those? I don’t miss cheese or milk. I always found cheese a bit too fatty and milk gave me bloating in my stomach. The only thing what I missing is the yoghurt, though here you can’t buy good quality. Did you make any interesting discoveries? I didn’t get stomach bloating and very heavy stomach after a meal. Have you had any tangible changes in your health? You know, ones that can be measured like blood work changes or weight? We didn’t do the blood test :-((. Maybe I lost 1-11/2 kg, but from my weight is enough. During the challenge we had a hectic life and I did’t have time to do exercises. Have you felt any difference in yourself? Increased / decreased energy levels, fewer headaches, more headaches etc. There weren’t bloated stomach, and heavy stomach after meals. I don’t remember headaches. Any new favourite dishes / foods that you can’t live without? A lot and discovering more and more!! If you could sum up your 30 day experience in one sentence, what would it be? I should have done it earlier!! Passionate about sharing the benefits of a plant-based diet.